An elderly mild-mannered gardener becomes a lovable legend in his town for his talent to romantically please every woman that fancies him. Even funnier than "Carry on Nurse!" Deborah Walcott: You know Dr Golfrey's secretary? That flighty young thing? Well, she's flown. 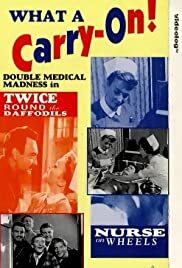 Juliet Mills is the new district nurse in a rural English village in this slight but amusing movie, populated by amusing eccentrics, in this mild version of CARRY ON NURSE. She deals with the usual comic issues of the National Health service and is pursued by a sturdy and stiff young doctor, with the usual mishaps one would expect in a movie directed by Gerald Thomas. Juliet Mills is pretty, young and handles her standard-issue role very well, as one would expect of some who had a movie career stretching back more than twenty years (her first role was as a baby in IN WHICH WE SERVE under the direction her godfather, Noel Coward). One would hardly expect less of a daughter of John Mills, whose sister Hayley was a juvenile star. Even so, this is a slight affair; her role was intended for Joan Sims, who wound up taking a supporting role. Given the popularity of "young women in the world" comedies in the 1960s, this is not particularly memorable.